“In a hole in the ground, there lived a hobbit.” These were the words that launched a thousand fantasy novels and captivated generations of spotty schoolboys and students with too much leisure time. With the publication of the Hobbit, J.R.R. Tolkien, an Oxford academic, introduced the world to Middle Earth and either created or popularised a number of the standard memes of fantasy literature. Without him, we may well not have the likes of Pratchett, Eddings, Feist, Leiber and a host of other writers. As well as books, there are films, music, cartoons, video games, role playing games, board games, plays and musicals that have drawn on the themes and ideas that Tolkien introduced in the Hobbit, the Lord of the Rings and the Silmarillion. Since its first publication in 1937, the adventures of Bilbo Baggins, Gandalf, Thorin Oakenshield and the other members of the company that journeyed from Bag End to the Lonely Mountain, via Mirkwood to dispossess Smaug the dragon of his ill-gotten treasure and re-establish Thorin as King under the Mountain have enthralled millions of readers. Entire books of analysis and criticism have been written, making any efforts on my part superfluous. 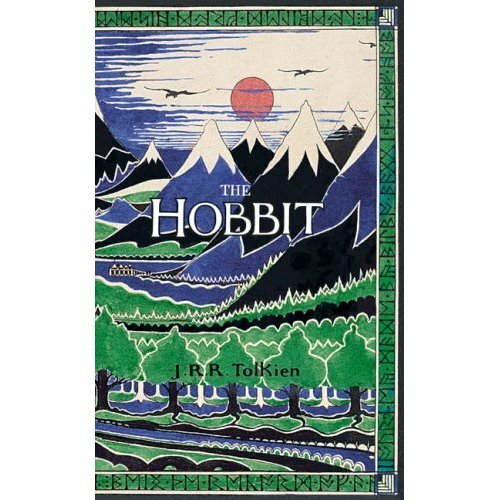 Having sold between 35 and 100 million copies worldwide, the Hobbit is generally considered a classic of children’s literature and one of the few children’s books to command a wide adult readership. I first came across the Hobbit as a small boy in the 1970s. It transported me from small town life in the Home Counties to a far-away land where adventure could, and did, happen to even the staid Mr Baggins, whose idea of daring was leaving home without a decent supply of pocket handkerchiefs. I eagerly followed Bilbo on his journey from timid inhabitant of Bag End to burglar, Elf friend and Giant Spider slayer. The Hobbit led me to the Lord of the Rings and then to a juvenile passion for Dungeons and Dragons and other role playing games and instilled in me a lifelong enjoyment of fantasy novels. I even read it in French on a family holiday to Normandy (how sad was I!). The Hobbit is often recommended as a way to encourage 11-14 year old boys to read and, although I was already a keen reader when I picked it up, I would completely agree with this. Although it is a prelude to the Lord of the Rings and usually viewed in this light, it is really a wholly separate work. The tone of the Hobbit is very much that of a children’s novel. For example, one of the stylistic tools Tolkien uses is that of the author speaking directly to the reader. Usually I find this irritating but, in the context of a story intended for children, it seems to work. If you expect this tone to be maintained in the Lord of the Rings, you will quickly be disappointed as, somewhere between Bag End and Rivendell, the tone shifts to that of an adult book. In reality, although Tolkien made some amendments to the second edition of the Hobbit to make it more consistent with the Lord of the Rings, he didn’t intend the latter as a sequel. Indeed, following the initial success of the Hobbit, when his publisher asked him for more on Middle Earth, he responded by writing the Silmarillion. This was set in a much earlier period of Middle Earth’s history, with none of the same characters and written in a wholly different tone. In re-reading the Hobbit as part of the Banned Books challenge, I tried and failed to understand why it would have been burned (in New Mexico) or banned (several libraries and schools in the USA). Apparently, Tolkien’s works are considered “satanic” by some Christians. Now I confess to being no theologian but I can’t really see which part of the Christian faith is threatened by Bilbo. Presumably, it must be the acceptance of magic use but maybe someone could enlighten me. Is this a book that must be read before one dies? Unequivocally, yes, yes, yes. Not only is it an important work but it is a great read. If you were unfortunate enough not to have encountered it as a child, get a copy now and read it. If you have a child, buy them a copy and, if possible, read it with them. Please. It will be worth it. This is one of my (Em) absolutely favorite books of all times. I can't understand the burning/banning/challenging of this one either. oh! also, feel free to enter your review in our Banned Books Month giveaway! Thanks for stopping by. There are some books where I can see why people might get offended or with which governments might have problems, even though I won't agree with them being banned or burned but the Hobbit? Seriously? I'm not sure whether it was done more for publicity or whether some people have very strange ideas. does anyone know exactly where and/or when the hobbit was banned? need help for school project. thanks.